For the vinaigrette, remove seeds from pear, place in vitamix or high-speed blender, add remaining ingredients and blend until completely smooth, set aside. For the candied pecans, mix pecans with ingredients, line a pan with parchment paper or foil, place in a toaster oven at 300 degrees for about 7-10 minutes. Then flip them around using a spatula and leave them in for another 7-10 minutes. Remove from the oven and set aside to cool. 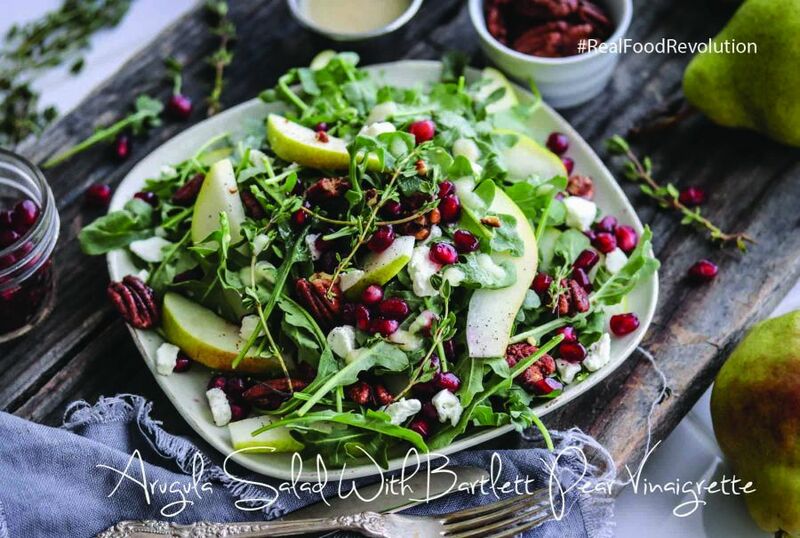 Place arugula in a bowl and top with pomegranate seeds, slices of pear, vegan cheese or goat cheese bits, and the candied pecans. Drizzle Bartlett pear vinaigrette on top, enjoy!